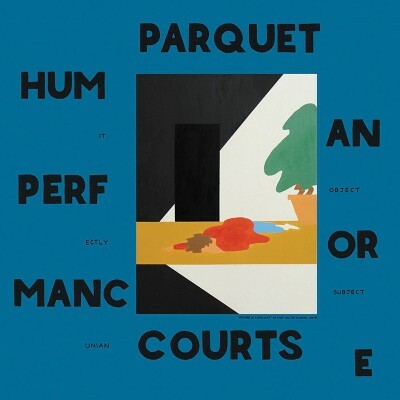 I try to remember that music reviews are usually little more than entertaining displays of bias, and Parquet Courts put mine on parade—raw recordings, vaguely ’60s, Western tones, deadpan delivery and literary lyrics. I’ve been smitten since the first listen. For their fifth studio album, Parquet Courts haven’t deviated far from the quintessential sound that they’ve been cultivating for years. However, coming off of the moody and media-frenzied Content Nausea, the theme of Human Performance continues with self-examination and self-criticism in an increasingly distracting world. Head cleared, we’re led into the title track, which depicts the ending of a relationship and the speaker’s sudden reassessment of his identity—“Is love just a performance? Is grieving a performance?” etc. Savage calls out “Phantom affection gives a human performance / Witness it now / Fractured and hurt” with a rare use of echoed vocal effects to amplify the feeling of longing. This issue of loss and isolation recirculates again and again in different moments throughout the album. In The Velvet Underground–esque lullaby “Steady On My Mind,” Brown sings, “I’ve never felt committed to much but that don’t mean that I can’t learn / To reciprocate what you send my way,” and in “Berlin Got Blurry,” Savage says, “Feels so effortless to be a stranger / but feeling foreign is such a lonely habit.” The band seems to be consistently struggling to reconcile their human desire to feel connection and the solipsistic byproduct of independent youth culture (see also: Father John Misty’s I Love You, Honeybear).